It's been dreadfully and boringly quiet here. Truth is, I haven't been working on anything new. So, instead I'll talk about something old. Back in September of 2010 I acquired a paddle loom. curly maple. It technically doesn't have a "paddle"
because I wanted it to be as short as was practicable. I got the idea from Janea Whitacker from Colonial Williamsburg. At Costume College 2010, she had a box loom with her. I decided I wanted something that took up less space, so opted for just the standalone heddle, generally called a paddle loom. The paddle loom also allowed me to have more "dents" (the slots and holes), since the box looms I found used narrower heddles. 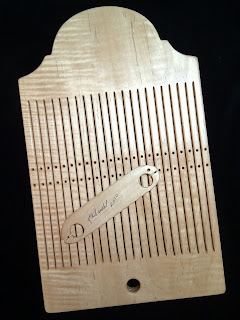 Mine was made by Jonathan Seidel (http://www.jkseidel.com/) and is a gorgeous curly maple. I set to weaving what I had on hand: DMC pearl cotton and DMC cotton 6-ply embroidery floss. 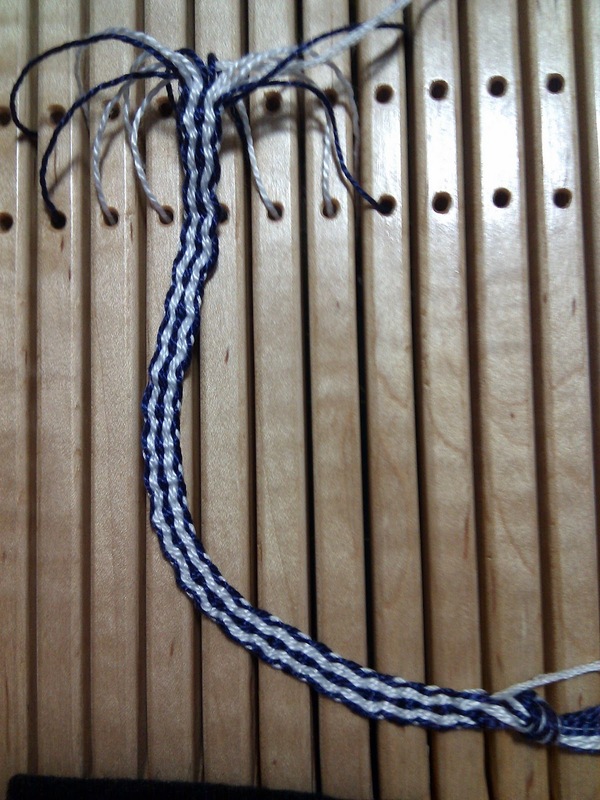 My first experiments used 13 and 15 warps, and I experimented with different numbers of plies for the weft. I also experimented with different warp patterns. colors I wanted to get rid of). I used a full 6 plies for the weft. 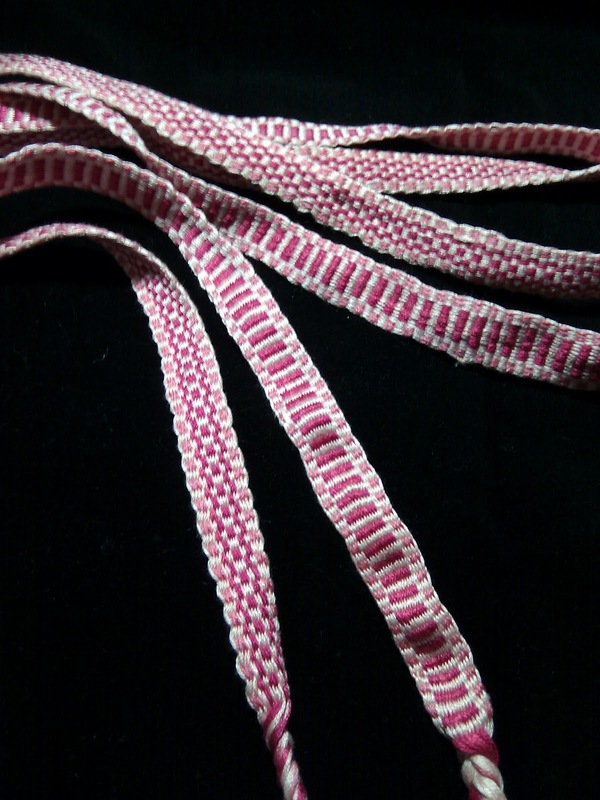 So what can you weave with a paddle loom? I wove myself a pair of stocking garters. 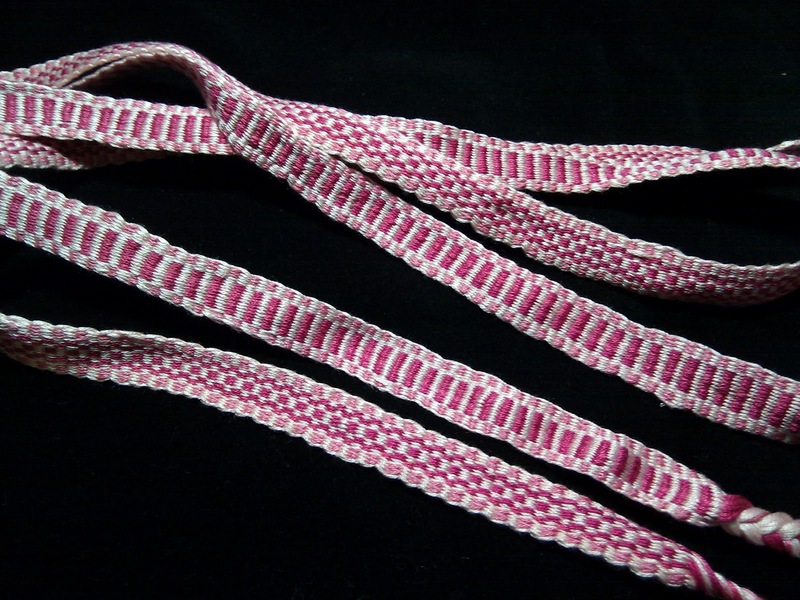 A pair of stocking garters, in three shades of pink. Yes, they only match in color, and mismatch in weave. I couldn't resist trying a different warp pattern for each one. These are about 41 warp threads wide, making them about 3/4" wide. With that many warp threads, the challenge with a paddle loom is to keep the tensions even. 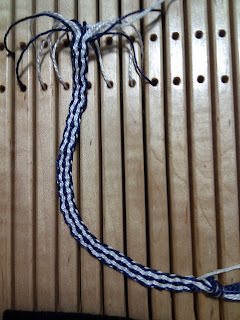 I invented a setup that lets me control the warp tension, and eventually I'll have to do a blog writeup about it. Here I also used 3 plies for the warp, which made the tape flatter. and are about 3/4" wide. I've used these garters a couple of times now, and they do work quite well. I surfed the web a bit in writing this post, and see that there are some great looking table-top looms available. Box looms (as seen on Jonathan Seidel's website) and paddle looms like mine have some historical backing, so if you're interested in doing historic demonstrations, those might be more appropriate. If you want to be able to weave wider wares, you may want to consider a table-top loom. If you really just want to save space (like I do) and maybe also some money, go for the paddle loom. 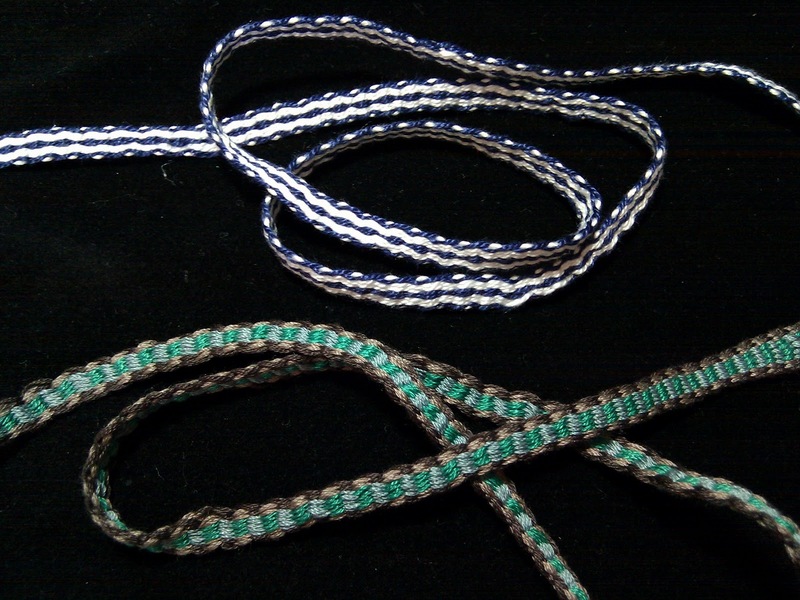 String heddles are non rigid. 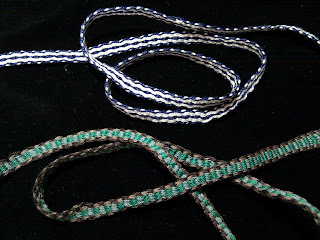 They are used in backstrap looms, and some other simple looms. I would love to know more about the setup you invented to better control the warp tension on a paddle loom. I am just starting out with one, and it is tricky! Hello turfwriter, and thanks for you interest in my much neglected blog. In the years since I got this paddle loom, I've also acquired a table loom, and learned quite a bit more about stabilizing the warp. 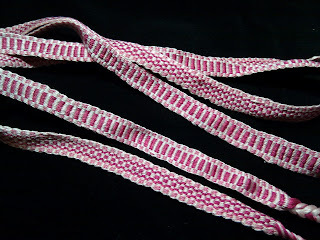 You're giving me the idea to pull out my paddle loom again, though, so maybe I'll weave another tape sometime soon, and do a post that includes a (new and improved!) warp set-up. I have a box loom and I just acquired a paddle loom and I would love more information about both. I will try and watch For your post.